Typically the least expensive fresh milk option—conventional milk—comes from cows that are fed almost entirely grains such as corn rather than their natural food, grass. This makes them cheaper to raise and makes the milk they produce cheaper per gallon. They may also be administered the manmade recombinant bovine growth hormone—normally referred to as rBGH—that was approved by the FDS in 1993 to boost milk production. The FDA says milk from rBGH-treated cows is safe. But health concerns still swirl, making rBGH’s use controversial. Many large supermarkets no longer sell the milk of rBGH-treated cows, and many dairy processors no longer accept milk produced with rBGH. Cows on conventional milk production facilities can be given antibiotics, if necessary, but they can’t be milked until the drugs clear their systems. By law, milk is drug tested right before processing to check for illegal residue levels. If they’re present, the milk is not sold for human consumption. In terms of broad nutritional content—protein, fat and carbs—organic and conventional milk are about the same, but organic brands can cost twice as much as conventional. However, more and more people are deciding that the higher quality of organic milk makes it worth the price. To be considered organic in the US, milk must come from cows that graze on pasture lands for their entire grazing season—between 120 and 365 days a year depending on geographic location, according to USDA rules. Grass must be at least 30% of their diets during the grazing season. The grass and the rest of their feed must be grown without chemical pesticides or fertilizers. One benefit of the grassy diet is that organic milk contains a significantly higher level of beneficial omega-3 fatty acids than conventional milk—according to one study, about 62% higher. Dr. Gardner’s take: The omega-3s found in the milk are linolenic fats, good but not as beneficial as the omega-3s found in fatty fish—DHA and EPA. So, keep getting omega 3s from fish even if you drink organic milk. Equally important is what organic milk doesn’t have in it— no added hormones and no antiobiotics, ever. If an organic animal gets an infection that requires antibiotics, it can (and in fact must) be treated, but its milk can then no longer be sold as organic. For decades, whole milk—milk with all of its fat left in—was considered a harmful blast of fat and calories by health professionals and consumers alike. However, opinions on the health of full-fat dairy fat have changed, with new research emerging suggesting that consuming whole milk does not increase the risk of obesity, cardiovascular disease or diabetes—and may in fact even reduce the likelihood or severity of these conditions. Regardless of the fat content, all milk contains about the same eight grams (g) of protein and 12 g of carbs per cup and about 275 milligrams (mg) of calcium. Taste and consistency are matters of personal choice—full-fat or 2%-fat if you prefer a creamy mouthfeel, lowfat or non-fat if you don’t or are simply trying to cut calories. Lactose-free milk. You probably know that this milk contains the enzyme lactase that is low in the digestive systems of people who are lactose-intolerant, letting them drink it without the typical symptoms of bloating and discomfort—it also has a longer shelf life, so it’s handy to have in your fridge. If you’ve shied away from it in the past, know that it’s now available in organic varieties, too. Note: Read “What’s That Mean? Lactose Intolerance vs. Milk Allergy” if you’re not sure why you have a bad reaction to milk. A2 milk. If you’re bloated and get diarrhea after drinking milk, yet aren’t lactose intolerant (or unsure whether you are), you could be sensitive to a milk protein called A1 beta-casein. Ordinary milk usually contains both A1 and A2 proteins. The dairy industry is now offering A2 milk, which comes from cows genetically tested to ascertain that only the A2 protein is in their milk. The theory—and what many people report anecdotally—is that A2 milk doesn’t cause digestive distress, although to date there haven’t been any large, independent studies in people to prove this. The milk has been available in Australia for 10 years and is now for sale all over the United States at a cost similar to that of organic milk. Note that A2 milk is not lactose-free. The pasteurization process that kills most of the harmful bacteria also wipes out healthful bacteria found naturally in milk. Proponents of unpasteurized or raw milk say that drinking it can help restore beneficial bacteria to the gut. States set their own rules about whether and where raw milk (of any kind) can be sold legally, with about 30 permitting it at the farm, farmers’ markets and/or grocery stores. Some raw milk producers have claimed that the non-harmful bacteria in raw milk allows people with lactose intolerance to drink it without symptoms. To test this claim, Dr. Gardner and fellow researchers recruited a group of 16 adults with known lactose intolerance. Participants were alternately given raw milk, pasteurized milk or soy milk (which has no lactose and was used as a control) over eight-day periods. The results? Both of the dairy milks produced the familiar unpleasant reactions among the study participants. Of greater concern: The Centers for Disease Control and Prevention warns that raw milk can be contaminated with dangerous bacteria including Salmonella and Listeria, which can make you very sick and even land you in the hospital. Between 1993 and 2012, 127 outbreaks of food poisoning in the US were linked to drinking raw milk. Some milk producers use filtration systems to create milk with more calcium and protein than ordinary milk. There are two national brands on the market: Fairlife and Hood’s Simply Smart. Fairlife runs its milk through five differently sized filters to separate the protein, minerals, carbs, fats and water, then recombines each component into milk with 13 g of protein per cup (vs. 8 g for regular whole milk), 370 mg calcium (vs 276 mg), 6 g of sugar (vs 12 g) and no lactose. It’s available with 1% or 2% fat.. Simply Smart’s filtration process does not remove lactose and other sugars. It has about 10 g of protein per serving and 350 mg of calcium. It’s available fat-free or with 1% fat. Both brands are almost twice the price of regular milk, but if you want a richer taste with more calcium and protein than regular, they may be worth a try. Shelf-stable milk is pasteurized at very high temperatures (ultra-pasteurized) and packaged in sterilized, aseptically-sealed containers. Once opened, it must be refrigerated and will stay fresh for about a week. Organic and conventional brands are available. Evaporated milk is made by removing about 60% of the water in milk, then canning and heat-sterilizing it. A good option for recipes, undiluted evaporated milk is about as thick as cream. You can reconstitute it by adding equal amounts of cold water. This is not the same as sweetened condensed milk, which is extremely high in sugar and used primarily in dessert recipes. Nonfat powdered milk is made from dehydrated milk and is inexpensive and easy to reconstitute. Once mixed with water, it will keep in the fridge about five days. Store powdered milk in its original container, tightly closed and in a cool, dry place. Kefir is a slightly sour fermented milk drink produced by probiotic bacteria and yeasts. Akin to a drinkable yogurt, it might help reduce diarrhea associated with taking antibiotics or help with other intestinal problems. Find ways to use kefir in recipes here. Cultured buttermilk is another fermented drink. It’s made by adding lactic acid bacteria to milk. As a result, it typically has less lactose than conventional milk. It’s relatively low in fat but not fortified with vitamins. It has a tart taste and is often used in baking. 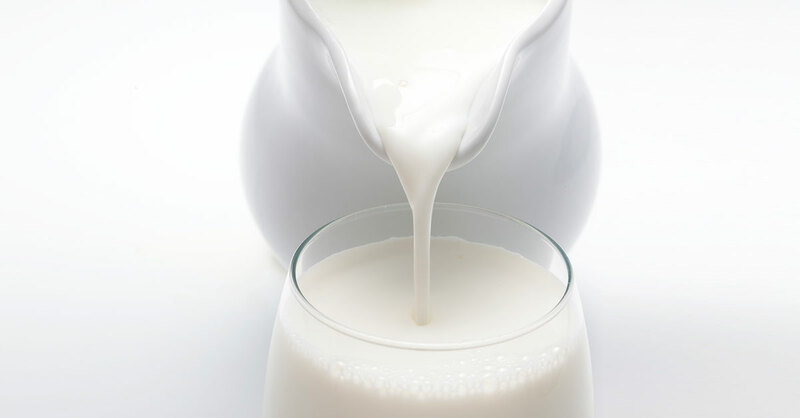 One study found that cultured milk products are associated with a decreased risk of developing bladder cancer. Goat’s milk is close to cow’s milk in terms of nutrients with the notable exception of having slightly more calcium—at 325 mg per serving vs. 276 mg for cow’s milk. It’s often fortified with vitamin D. It also has a strong taste that doesn’t appeal to everyone. Learn about buffalo, camel and other exotic milks here.